To leverage Motorola Mobility, as a Google company, to launch Moto X in the highly competitive Smartphone market was the opportunity. 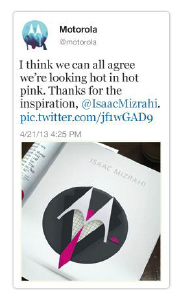 We collaborated with Razorfish's digital creative and social media teams to create pre-launch buzz. The comprehensive socal meida launch is diagrammed below. 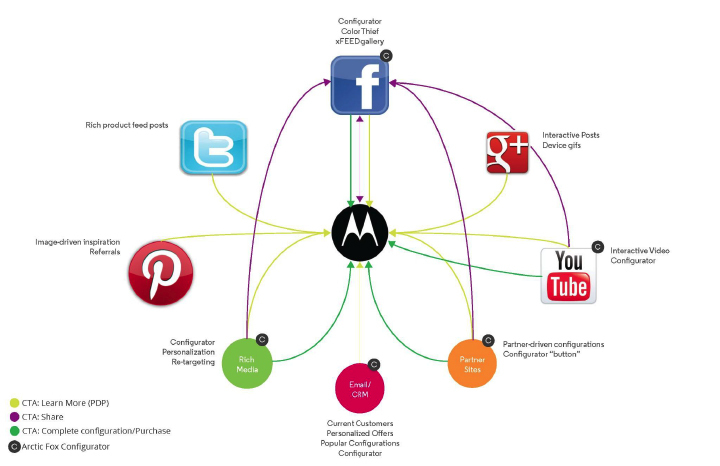 We created and positioned social content, Moto Maker http://www.three.co.uk/moto_maker, eCommerce Everywhere and the Motorola Social Truck with a witty, comfortable and confident brand voice. Pre-launch day concepts included tweets with personalized doodles, physical gifts for influencers, and playful irreverent posts on Facebook. Here are a few examples and a graphic defining campaign ojectives, goals and KPIs.